Calling All Engineers, Entrepreneurs, & Inventors: 3D PRINTER FOR HOME USE IS HERE! It’s finally here ! You can make your own pre-prototype right at home. 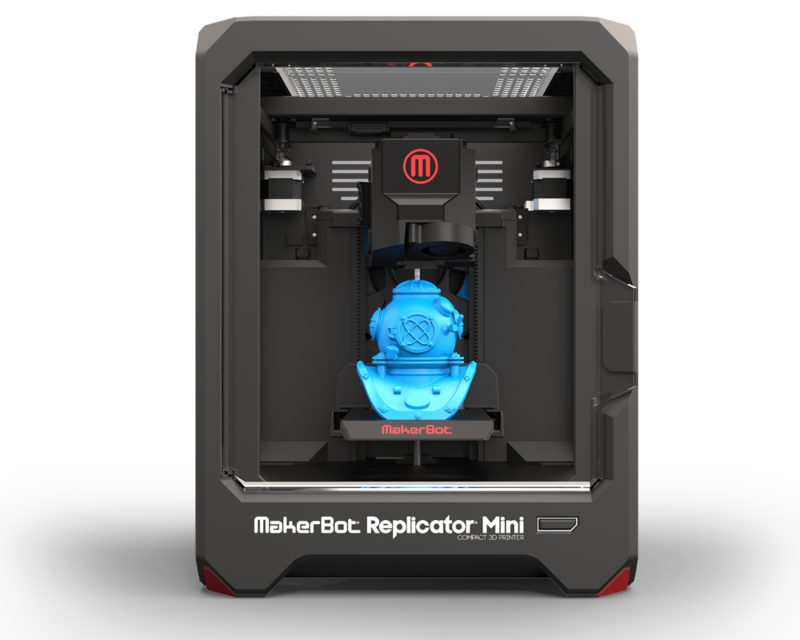 MakerBot Replicator Mini Replicator3D printer. An early version last year had glitches that supposedly were dealt with in its’ latest version. It still remains small and is fairly slow–on the plus size is its’ ease of set-up and the user’s ability to monitor its’ printing progress. MarkdownMom found prices ranged from a low of $600 on Ebay to a high of $1400. Still a rather expensive novelty–you may want to wait for technology to catch up to its’ potential. Online Home Shopping Networks Source Of Designer Haute Couture! The online shopping networks traditionally selling kitchenware and household items to homemakers have evolved into a source of designer runway fashion at bargain prices. What is even more remarkable MarkdownMom has found over the years is that many fashion trends are available online ahead of mainstream brick and mortar stores. For instance, MarkdownMom began buying the high/low hem dresses nearly two years ago from ShopNBC (now SHQP) at great prices. Recently, MDM saw this dress at ShopHQ reminiscent of Eileen Fisher’s Handkerchief Dress w/Ties done in colors (pale pink, dk. navy) at substantially more. This Casual Convertible Maxi Dress from OSO is offered in 4 colors and although it is made of cotton and not a silky fabric or pure linen, the design element is the same, offering two looks with its’ adjustable hem at a feature price of $47.93 (on 2 value pays) making it extremely affordable. With its’ six gore skirt in a light weight cotton, this dress looks great with its’ hem up or down and is a very sophisticated fashion statement! Home shopping networks and so-called big box stores like Target (Mossimo) have recruited top names from the fashion industry to bring their style and uniqueness to midAmerican consumers recognizing the growing number of professional women in the workforce and at home who want style at an affordable price. HSN, QVC, and SHOPHQ not only have special lines from designers like Isaac Mizrahi, Bob Mackie, George Simonton, Donna Karan, Betsey Johnson (to name a few), celebrities such as Iman, Joan Rivers (and many others), but have become a venue for new female entrepreneurs such as Lori Goldstein and Joy Mangano, plus their own in-house designers as well. Thus making online shopping an ongoing source of what’s hot, new and undiscovered in the fashion world. A boon for both the consumer and the designer as well! In keeping with its’ designer program, last week Target® introduces its latest couture bargain line by Missoni. Missoni known for colorful design patterns and knits in the fashion world is now affordable to all fashionistas. You don’t have to spend $800 at Neiman-Marcus® for a knit zig-zag pattern Missoni dress. Get the look at Target® for under $55 in sizes XS-XL. You may have to wait since this line is so-o-o hot, many styles are ‘out of stock’ online. Don’t discourage, many in store shoppers loaded up the limited stock to resell on Ebay™–still cheaper than you-know-who. One of the latest fads in jewelry has been the personalized creativity bead bracelets. Making its’ appearance around the holidays, this was one way to personalize jewelry for your loved one. 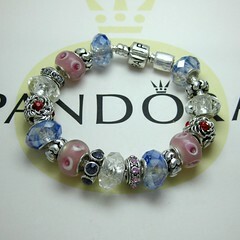 Beads on a silver circle bracelet is a great 21st Century take on the charm bracelet. Many of the beads are artisan glass creations including ldots, swirls, sayings, murano glass, sterling silvers, spacesr and more. Now, you can go to a jeweler and build your own, or as MarkdownMom found you can find a wonderful selection online and instore at a real savings. At Shopko® you can buy beads for as low as $6.74 instore and bangles at half the cost of jewelry stores. QVC has quite a selection with its Prerogatives line of over 600 beads, slightly higher, but well worth considering with Mother’s Day on the horizon. You can call this a charm bangle, a Pandora bracelet, or your own–a keepsake that reflects your personality! It’s all in the accessories–or so we are told. Now get that designer look in handbags at an affordable price. At Bag Inc find au courant bargains on purses, jewelry, belts and even satchels for men! Celeb bags, messenger bags, evening bags and colors galore. Celeb look plus cash leftover–how cool is that? Free Shipping on purchases of $99 or more. Ulta®, a store along the lines of Sephora but often with a hair salon, has more crackle nail polish for those of us still looking. 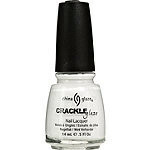 China Glaze Crackle Nail Laquer comes in 6 colors: Lightening Bolt, Cracked Concrete, Black Mesh, Crushed Candy, Broken Hearted, and Fault Line. $8.00 each. Sign-up for their rewards program and coupons! Okay, you dress to the nines for the holidays, right? How about dressing so that you sparkle down to your fingertips? Now you can create super glitzy nails to match your sequin top. BYS Complete Cosmetics has a black overlay you put on your nails that will crack revealing your polish underneath and the overall effect is pure bling! You can buy it in a kit from Fashion Addict.com afor $1 for $11.53 + sh. Want the same effect closer to home? Wait for OPI’s Black Shatter coming out in January 2011. 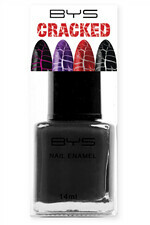 Or try Barry M crackle top coat. While we are talking about nail polish, Sephora is having A Sale On Sale . Get an extra 20% off any sale item online. Enter Promo Code:EXTRA at Checkout. Get Snap, Crackle, and Pop Glam For The New Year! Look Like Beyonce For Under $30? The View showcased Beyoncé and her designer mother, Tina Knowles, on Monday, November 22, 2010. Macy’s and other large chains have carried their clothing line; however, now they have partnered with WalMart and the advantage to the consumer, this stylish line has WalMart prices! This line was introduced in October and has been so popular that many items flew off the hangers, but WalMart has replenished it’s stock so hurry to get your favorites–they won’t last long! This line includes sizes 2-20 and sizing up a particular style was done with care so that a woman no matter what size will look sensational in these designs! MarkdownMom especially loved this taffeta jacket in pewter for $25! Complete the ensemble with all-over sequin feather tunic in pewter$12 , and ruched pewter leggings $10.00–sizes XS-XXL. Remember you can have each item shipped to home for only 97¢ each. Okay, let’s admit it, we’re all material girls and yeah, we like to have fun, too! And to add to your own gaga look get Lady Gaga ” The Fame Monster” tattoos. Temporary tattoo sheet for only $5.00, plus I LOVE LADY GAY GAY tattoo. Visit her site where you can find memorabilia, apparel, and accessories!